Choosing a safe for your home usually comes down to two factors – the fire rating and/or the burglary rating. What are you trying to protect? If you would like a safe to safeguard only important papers and documents, then we recommend choosing a safe featuring a high fire rating along with an appropriate burglary rating. If you have important papers and valuables or jewelry, then you will likely want to choose a safe that features both a high fire rating and a high burglary rating, such as a TL15 or a TL30. Are you trying to keep guns safe and out of reach, and protect a few important papers and valuables? Then you may possibly want to purchase a high quality gun safe that features a high fire and burglary rating as well. We would be happy to talk with you about your particular needs and make some recommendations. A safe for your business is usually chosen based on the level of security needed, combined with the functions that your business needs. There are many options to choose from in the business safe market. A brief rundown of some of these includes drop safes that offer a money in option, but no employee access, drop safes that offer an inner compartment for protection but a separate till for employee access, higher rated burglary safes that withstand all-out attacks, heavy duty safes that are rated for both burglary and fire protection, safes with smart locks that can limit time of access, who can access, how often they can access, and even audit capabilities that identify who was last in and when. We would be happy to help walk you thru your business needs and recommend just the right safe for you. Are your sales prices comparable to online stores? We work hard to keep our prices competitive and affordable! However, buying at Admiral Safe is a different experience than a simple online purchase – which often means dealing with one company that sells you the safe, one that ships, and an unknown third party to install it. We offer the best COMPLETE job price out there – taking care of every step of the process for you, from acquiring the safe you’ve chosen to delivery to installation. Included in our price is the security of knowing that Admiral is your one contact from sale to install to any future service needs. Do you deliver and/or install the safe that I purchase? Yes, we are a full service company. We offer both delivery and installation of any safe that we sell. What brands of safes do you carry for sale? We are proud to carry the best safes out there! 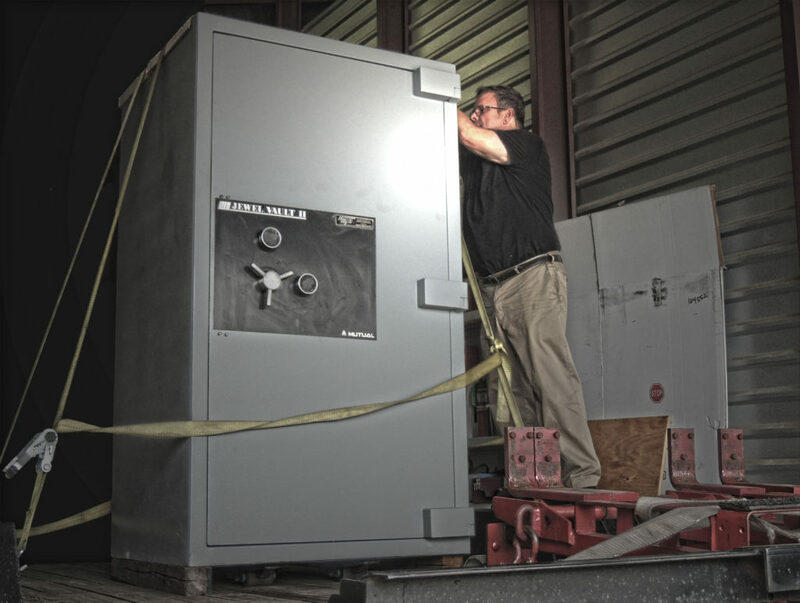 Amsec, the largest safe manufacturer in the US, makes a great product – high quality safes that come in a variety of fire and burglary ratings and sizes. We also recommend Gardall, Hayman, and a few other brands as excellent quality safes. Do you carry gun safes? We do, and we recommend Amsec gun safes. They offer superior protection AND fire ratings. Do you sell discounted used safes? Absolutely! Used safes are a great way to get a quality safe at a great price – usually more than half off the original price. Call to find out what we have right now.